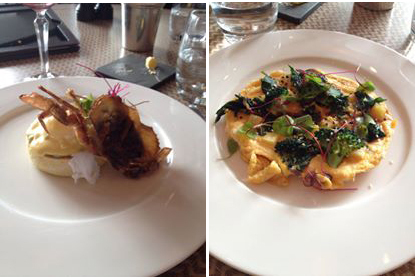 Bottomless Brunch @ One Canada Square. Brunch is an American tradition which seems to be finding its way into more English restaurants these days. Brunch feels a little decadent to me and a lovely weekend treat, so I was delighted to have the chance to review the Bottomless Brunch at One Canada Square. The restaurant is slap-bang in the middle of Canary Wharf, in the lobby area of the Wharf’s most iconic building. The deal is a choice of two courses for £20 or three for £25 and if you want to take up the “bottomless” option, it’s another £15 for unlimited wine or cocktails. 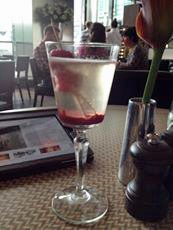 We started with a Raspberry Bellini which was as pretty to look at as it was tasty to drink. To eat, I began with the soft shell crab Benedict. The addition of the crab turned this traditional breakfast dish into a more savoury lunchtime version. My guest went for the healthier choice of braised kale and broccoli omelette. This was nice and light but the addition of sesame oil and seeds gave it a slightly oriental flavour. 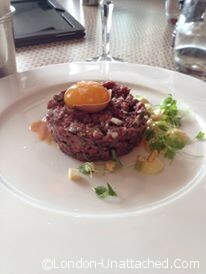 Amongst the choices for main course was steak tartare. As this is a rarity on menus outside of France, I had to give it a go. It was perfectly seasoned and again picture perfect, with the egg yolk served in its shell. My guest went for the safer choice of the Shorthorn burger. However, he felt that there was rather too much going on in terms of sauce and toppings, which detracted from the burger itself. Although a little full by this stage, we still managed to find room for dessert. We shared a portion of the baked New York style cheesecake, served with fresh blackberries and also the chocolate delice, salted caramel and burnt orange ice cream. The cheesecake was very tasty (especially with the fresh blackberries) but the star of the show had to be the Chocolate delice. 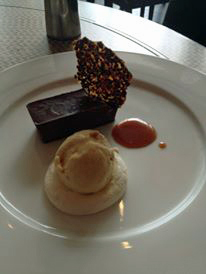 It melted in the mouth and with the salted caramel and orange ice cream, it was literally a piece of heaven on a plate! To accompany our food we had a couple of glasses of the house wine. This was exceptionally good for a house wine, especially as the bottomless deal means your glass is regularly replenished! The waiting staff have got exactly the right balance of being attentive without being too intrusive. As if all of this was not enough, we were also treated to some live music. Damian Flood was on the piano singing mellow versions of some chart hits. I think I would love this place. It sounds heavenly.. taking the usual and dressing it up just a touch! Good advice about brunching last…as the limitless drinks would make shopping a big risk after the fact. This sounds like a reasonable price for a popular location, especially the 15 pounds for unlimited drinks. Cheers !